AAVIN Milk Recruitment 2018 – Tamil Nadu Cooperative Milk Producers Federation Limited has released its official notification for the TN Aavin Milk senior factory assistant recruitment 2018 through their official website aavinmilk.com. The TN Aavin Milk mentions in their Tamil Nadu Aavin Milk Recruitment notification pdf that they are presently looking to hire capable individuals for the post of Senior Factory Assistant. Tamil Nadu Aavin Milk Recruitment 2018 mentions that there are 275 Senior Factory Assistant Posts available for applicants. This is the ideal opportunity for all candidates who are looking for government jobs after 12th pass. Every year hundreds of candidates are in search of 12th pass government jobs and the opportunity provided here by the TN Aavin Milk Corporation is one such opportunity for all you seeking government jobs in Tamil Nadu for 12th pass. All of you aspiring individuals who desire to work in the government sector in the State of TN Aavin Milk are requested that you read this article about Tamil Nadu Aavin Milk Recruitment 2018 and submit your TN Aavin Milk Application Form before the last date 25th July 2018. 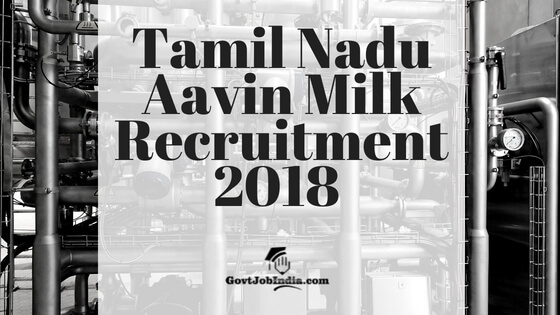 This article contains all the information you need regarding Tamil Nadu Aavin Milk recruitment 2018 including details regarding the Tamil Nadu Aavin Milk Eligibility Criteria, TN Aavin Milk Senior Factory Assistant Educational Qualification, TN Aavin Milk Recruitment Application fees and TN Aavin Milk Senior Factory Assistant Recruitment 2018 Application Process. We have also provided links that lead to the official Tamil Nadu Aavin Milk Recruitment 2018 notification and the Official Website of Tamil Nadu Aavin Milk. So keep on reading this article and avail all the information you need regarding the TN Aavin Milk Upcoming Recruitment 2018. All the information regarding the Tamil Nadu Aavin Milk recruitment 2018 is provided in the table below. You can find detailed information regarding each category of MU Senior Factory Assistant Recruitment in further sections of this article. 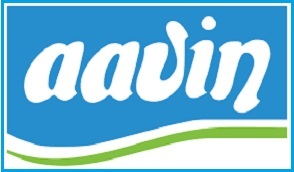 The Tamil Nadu Aavin Milk Recruitment serves to recruit ideal candidates for the post of Senior Factory Assistant purely in a number of locations. These locations have been tabulated below for your convenience. Aavin Milk Senior Factory Assistant will be paid a handsome salary amount of Rs.15,700 – Rs.50,000 (Pay Matrix Level 1) on a monthly basis. The TN Aavin Milk has deemed it necessary that all of you aspiring candidates who are applying for the TN Aavin Milk Senior Factory Assistant Recruitment 2018 must ensure that you satisfy the age limit requirement set by the Aavin Milk Recruitment 2018. Kindly glance at the TN Aavin Milk Recruitment age limit provided below. We would like to inform all the candidates that their age will be considered as per their age in 1/1/2018. Persons with Disabilities can avail further age relaxation schemes as made available under Government Norms. The merit will be based on the weightage marks of 100. Out of which a maximum of 40 marks will be given as weightage marks for SSLC/10th std and a maximum of 60 marks will be given as weightage marks for +2/ITI. Be advised that this Merit List is the only means of selection performed by the TN Aavin Milk. Furthermore any more details you require regarding the TN Aavin Milk Selection Procedure can be found in the TN Aavin Milk recruitment Notification 2018 pdf. A link for the same has been provided further along this article. We strongly recommend that you complete the TN Aavin Milk Senior Factory Assistant Recruitment pdf download and read it carefully for in-depth information regarding the TN Aavin Milk Selection Process. All candidates who are interested in this Tamil Nadu Aavin Milk Recruitment can submit their duly filled application forms online through the official website of the TN Aavin Milk which is aavinmilk.com. Candidates are also reminded that they have to pay the prescribed by the TN Aavin Milk Corporation through online payment methods which include credit cards, debit cards or through means of Net Banking. This has been tabulated below. Kindly ensure that you are paying the fees for your category. For further details regarding fee payment we would like you to visit the TN Aavin Milk Recruitment Notification pdf. How to Apply Online for TN Aavin Milk Senior Factory Assistant Recruitment 2018? Candidates who are interested in this TN Aavin Milk Recruitment are required to submit their accurately filled TN Aavin Milk Senior Factory Assistant Application form on the official website of the TN Aavin Milk and submit it on or before the last date on 25th July 2018. Along with the application candidates are also required to attach all the necessary documents mentioned in the TN Aavin Milk Senior Factory Assistant Recruitment Notification pdf. These include all the relevant documents like the caste certificates. Educational qualifications etc. Don’t forget to refer to the official Recruitment Notifications for more details. These are some of the major details regarding the Aavin Milk Senior Factory Assistant Application process. For more details kindly visit the Official website of the TN Aavin Milk or the Official TN Aavin Milk Senior Factory Assistant Recruitment Notification pdf. If you found this article useful the kindly share it with others who are also searching for government jobs in Mumbai. Also don’t forget to subscribe to our website and bookmark us on your favorite website for notifications regarding government jobs just like this one from every state in India. We hope that all the information regarding Tamil Nadu Aavin Milk Recruitment 2018 provided in this article has been to your satisfaction. We hope the very best for you and wish more than anything that you get the job you desire in the TN Aavin Milk.